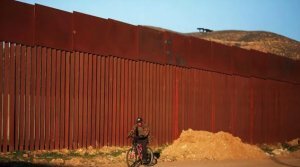 COULD THERE BE A LEGAL LOOPHOLE TO ALLOW FUNDING THE BORDER WALL? Pray for our leaders to work together to secure our borders and the fundamental privileges of U.S. citizenship. There is a law already in the books, 10 U.S. Code § 284, that allows the Secretary of Defense to assist in building fences to control drug smugglers along an international border. Could President Trump use this law to strengthen the border without going through Congress? “(a)Support to Other Agencies.—The Secretary of Defense may provide support for the counterdrug activities or activities to counter transnational organized crime of any other department or agency of the Federal Government or of any State, local, tribal, or foreign law enforcement agency for any of the purposes set forth in subsection (b) or (c), as applicable . . . Yes, thank you Lord for exposing hidden things that we were not aware of in the area of the Secretary of Defense having authority to assist in the building of a wall and other defenses to stop multiple violations/violators from coming into our country. Thank you Lord for revealing yet another way where there seems to be no way! Your will be done! Amen! If our President is going to sign for the 1.5 billion then yes this is a great way to go. No reason that I see that President Trump can’t get the money here. How we need that border! This sounds like an answer to many of us who are praying for safe borders for our country. I am thankful for these comments. God works out answers for our needs. Please add my voice to those who agree that this sounds like a solution to the problem if the Dept. of Defense agrees! I pray they do. Thank you Father God that you make away where there appears to be no way! You are sovereign over this nation! You have given us a leader who hears your voice and walks in the path of righteousness…..you give him wisdom. Your wisdom confounds the wise….you frustrate the devices of the crafty, so that their hands cannot carry out their plans. For your kingdom comes your will be done. In the name of our Lord Jesus Christ. I stand in agreement with these prayer warriors. Lord stop this insanity and BUILD THE WALL in Jesus Precious Name Amen! Yes I am in agreement. The wall is necessary and this appears to be the open door for Trump to walk though. Lord, Protect our president Trump. Guide and guard him as he walks with you. We long for America to return to following GOD, the One who looks to see if we are with Him or against Him. BUILD THE WALL!! GOD JUST MADE A WAY. FOR THOSE WHO PUSH THEIR POLITICAL AGENDAS AT THE EXPENSE OF OUR CITIZEN’S SAFETY, PUT ‘EM OUT TO PASTURE, PERMANENTLY AND PRAY FOR THEIR SOULS TO BE SAVED BEFORE IT’S TOO LATE! ALSO, CLEAN UP THE CORRUPTION IN OUR OWN IMMIGRATION DEPARTMENT OFFICES ACROSS THIS NATION. WE WELCOME IMMIGRANTS AND A DIVERSE POPULATION. HOWEVER, THIS MUST BE DONE LEGALLY SO AMERICA IS PROTECTED. FATHER, GIVE OUR GOVERNMENT LEADERS HEARTS FOR RIGHTEOUS LAWFULLNESS RATHER THAN HEARTS OF SELFISH UNLAWFULLNESS AS A MEANS OF BUILDING A LARGE CONSTITUENCY ILLEGALLY FOR THEMSELVES, IN JESUS NAME, HELP THOSE ON ALL SIDES, BEING TOSSED IN THE MIDDLE & UNWITTINGLY USED AS PAWNS BY THE EVIL ONE. LET YOUR GLORY LIGHT SHINE INTO ALL THESE DARK PLACES, FATHER. Thank You LORD. Lord make it possible for President Trump to build the wall. Since the Congress refuses to work with him, I pray he will go ahead and so what is so desperately needed to keep our country safe. Let’s keep praying. God has a plan! Heavenly Father thank you for giving President Trump and his advisers wisdom in dealing with finishing the construction of the wall!!! Heavenly Father, Please help this to be the green light to build the border wall without congressional approval. Please Heavenly Father, please give President Trump success in building the wall. Lord, please help him not to have to declare a national emergency or another government shutdown. In Jesus Name, amen. OH YES, MAY PRESIDENT TRUMP USE THIS LAW TO BUILD OUR BORDER WALL FENCE IMMEDIATELY AND BYPASS CONGRESS, IN THE PRECIOUS NAME OF JESUS. Yes! Build that Wall by whatever means necessary. It’s time to protect America! It needs to be done and this seems to be a safe avenue to move on and stop allowing especially dangerous illegal aliens from bringing danger to those especially living on these borders. It is time for justice to be done and help for those who are putting there own lives in danger to protect we the American people. I pray our president does not budge on his stand. This appears to give President Trump the go ahead to build the wall without going through Congress. I pray that it gets built–soon! !